Pa aniwuk pirlgapa ja nganaparru yangkungka. So the buffalo was coming this way, he crossed over to the island. You should say "he drifted over this way." I think he came from Wamarli. Yarranka qeqe yarranka yurtiny Iniwanpanyaliwi. He came here and came ashore at Iniwanpanyaliwi. Yurtiny wakapa yarranka tu nungpaka yutpiny tuka wurl. He came ashore he must have slept at the billabong. Yarranapa yuran ja Suki, ja Nawumut. Mm. he was going along and Suki, Nawumut went. Yuran fishing kapa pa inyilutpan jita kawani. He went fishing, so he dropped off his wife there. It's alright, that's all correct. He went along and then he saw the tracks. "Mm, that's a buffalo!" he said. "Naka jarrang nungpaka kapin ta yurnu." "That's like a horse track." Different - horses and buffaloes. Yarran parak iniyarrung parak iwarak. He went along, following its tracks. Pa aniwurrung "A ngungpurrun arrarrkpi yara imalngkawuy." Then he thought "Oh, it could be a person who's changed themselves into a buffalo." "He might kill me so I might go back." Yuranka awuniwirlung Ngalwangari la warranyngiw. He came back and picked up Ngalwangari (his wife) and kids. They were sitting there on the beach. Pa awaningan- apa awangkungka awurakankapa. So then they came back home. They were there, then he went home. Awaningan wupurrk yuranka iminy nuyu "Nga, ngulam atpana atpanuken la ngartayawng nuyu yurnu nganaparru. Then at night he came over and said to him, "Hey tommorrow we'll go and look because I saw a buffalo's tracks. "Ma." iminy nuyu ja Nangila, "Malany ngulam." "O.k." Nangila said to him, "Tommorrow then." Awutpiny awurakat jinyngu la ngarripa ngarrurujung. They slept then got up early while we were still asleep. Awarranapa iwuyarrungapa ngampi iminang parak, Aga. They went along following him and he went over there to Aga. Iwuyarrung Aga apa iminyka tuka Wiyarla ro alan. They followed him to Aga and then he came along the Wiyarla road. Alwaywi (straight) Awululk ilatpan parak. From Alwaywi he went straight down to Awululk. Yarran parak wujiwuji. Yarran parakju takapa ta alan, Anjumu alan. He went to the saltpan. He went straight along the Anjumu road. Mm, he was going along following the sand dunes, behind the beach. Qmqm, yarran parak ilatpan Anjumu. Mm, he went along, down to Anjumu. Pa yarrangung parakju takapa aniyarrukuning alan. So he went straight along, following that road. Awuwu pirr yarrangung parak, yurtiny parak. He kept going to Awuwu and then he went back inland. Yarran parak Wulakpirijapa, pa yarrangung parak takapa ajput. He went to Wulakpirij, he was going along the beach there. La kiki iminy aniwuk aniwuk pirl ta alan? So where did he cross the road? Wumarrk parak, aniwuk pirl warak. He crossed it lower down. Yung yalyung la ilajantung ja luluj iminang mali jarrang. He was lying there and he heard the dog barking but mistakenly thought it was because of horses. La nakapa ja nganaparru innyeyantung. But that was the buffalo he was noticing. I might give him this dog. He went along and stayed at Ngirtpin. Yarran parakapa qe wakapa ilangaling. He went there and stayed there. He stayed in the jungle at the well. He stayed there, he was staying there. They got up early the next day. That one (yellow) and them went. They all got into the car and went. They went along and they shot him, oh, he shot him. Awarran iwuwarrantiny kirrk la iwulatinyka iwumanyka. They cut him up and brought him back in the car. Yirrik naka ja murrkaj ja naka. Nulililut warrij. It was nice and fatty. Really tender too. They gave you (living) here some? Yes they gave us (living) here some. 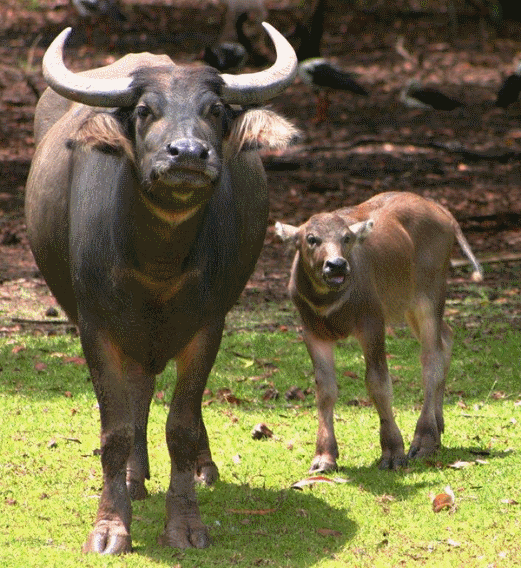 (All the community) nakapa (share) yirrk ngatpin, nganaparru, buffalo. All the community, we all shared that buffalo. They gave us some, what did they give us? We also got a front leg. Front leg or back leg? Ngarripa imawurr inimanyka ja nuka mawij. Your little brother brought us front leg. Parang la ngatpin share old man Ngorrkarak. So we shared with old man Ngorrkarak. So we cut it up and put it away. Yamin old man, Robbie yamin inimanyka. That old man Robbie he took it home. Ngarri ja naka ja aw very tender meat. Our bit was oooh, very tender meat. Parang la ngarrilangungapa ja irratat. So we were eating the meat. They gave it all out to everyone, Robert and his family. And Robert iminy, "Aw should be iwarutpanyi ja nganaparru ilangalinga." And Robert, he said, "Oh, they should have left that buffalo standing." "Kayirrkju la yurtinyka ta kani." "It's the first time he ever came ashore here." "They should have left him wandering around here." But no, we ate him. He came over here and came ashore. He came here and they just shot him. They should have left him. O.k then that's the story.